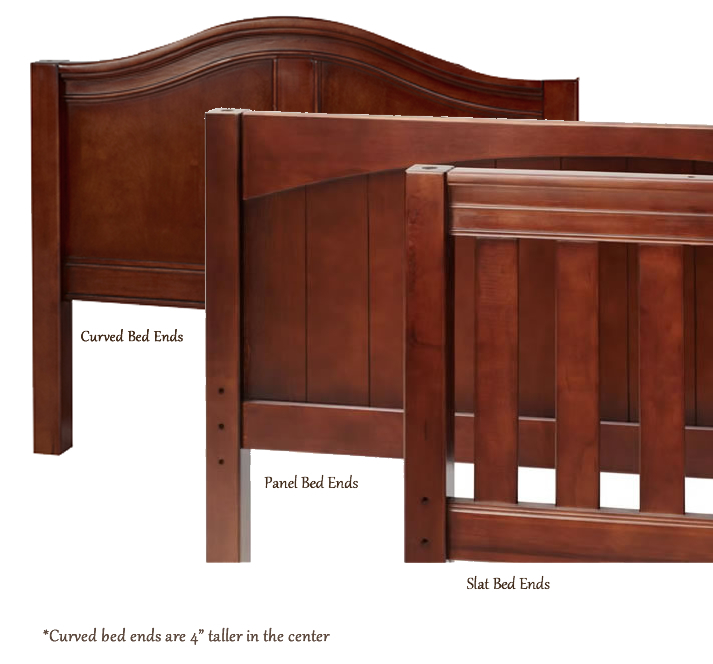 Full Description Princess Carriage Bunk Bed - Her chariot awaits! 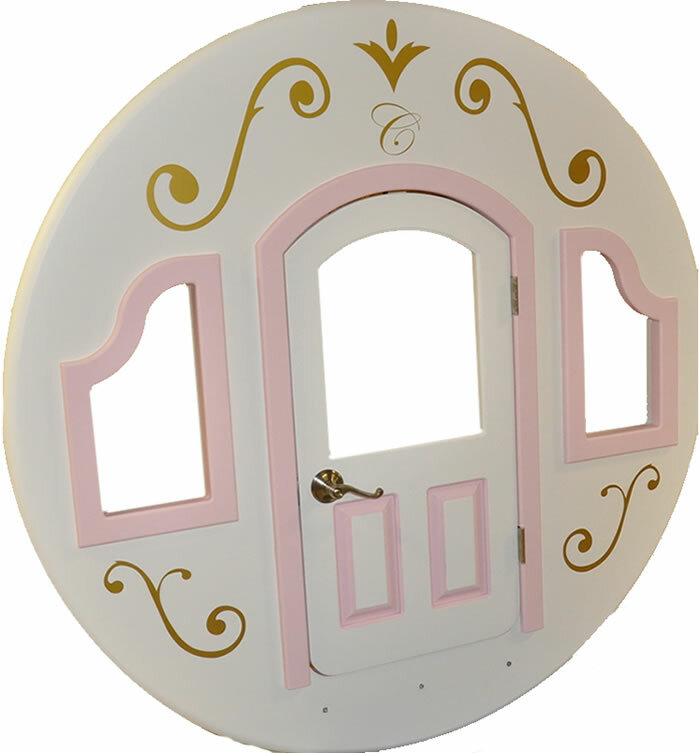 Your little girl will be thrilled with this kids princess furniture designed for royalty. Luckily for her, the princess carriage bed won't turn into a pumpkin at midnight! This exquisite design is a spin on the original Princess Cinderella Carriage Bed. Now available in a bunk bed, it offers twice the fun. 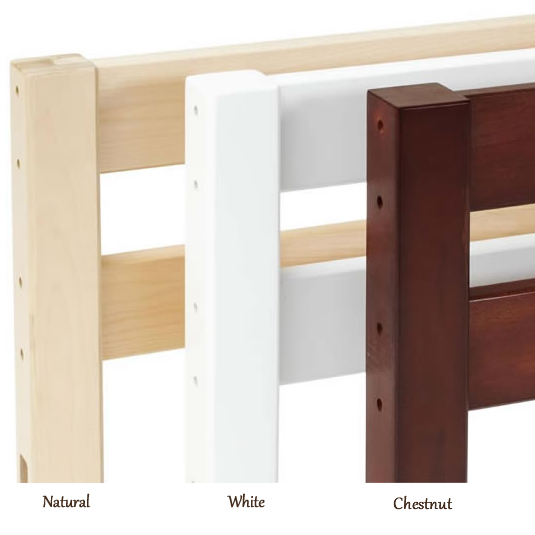 The standard bed is designed for two twin-size mattresses, but it can be modified to a full for only $350. Either way, your little girl will feel like a true princess when she walks up the elegant staircase leading to her very own princess carriage bed. (Please note that the product photo doesn't show the entire staircase. See the additional photos on the left to see the full staircase. The wall sconces on the other bed shown are not included.) This bed also includes a ladder to the upper bunk. 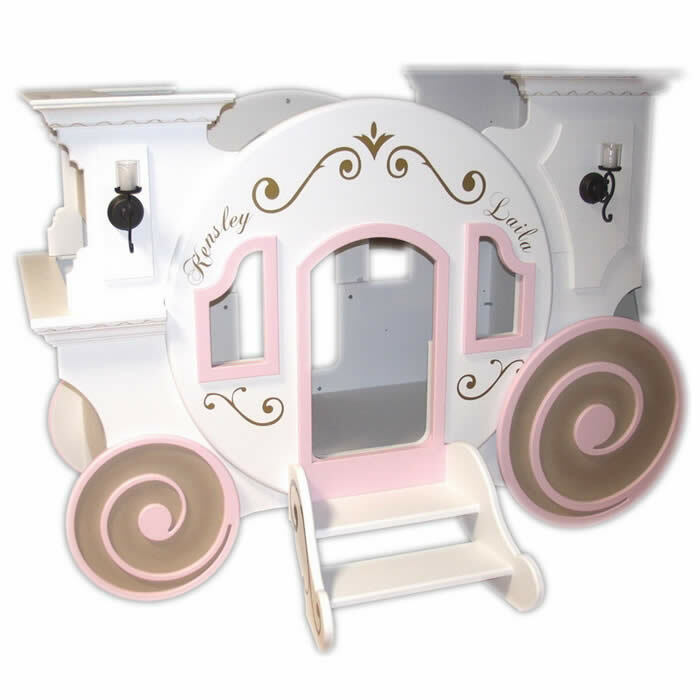 Kids princess furniture just doesn't get any better than this! 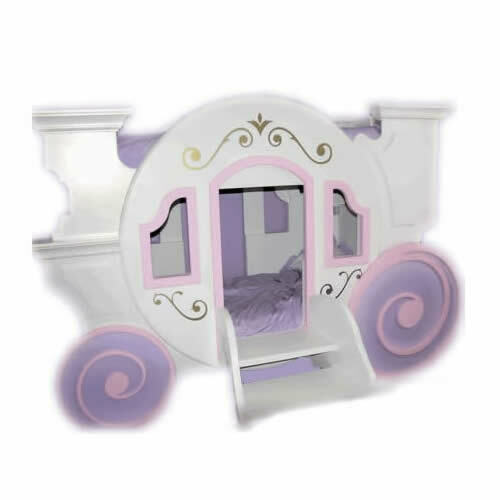 Wondering if the Princess Carriage Bed will fit in your little girl's room? Just send us a simple drawing showing the dimensions of your little girl's room with the locations of the windows, closets, and doors. We'll send you a computerized drawing showing this kids princess furniture in your little girl's room. Our drawing will show a bird's eye view with everything drawn to scale. Email drawings to us or fax them to 888.258.9331. Have an idea for a modification? Just ask. Our builders are amazing. We're convinced that they can do just about anything. 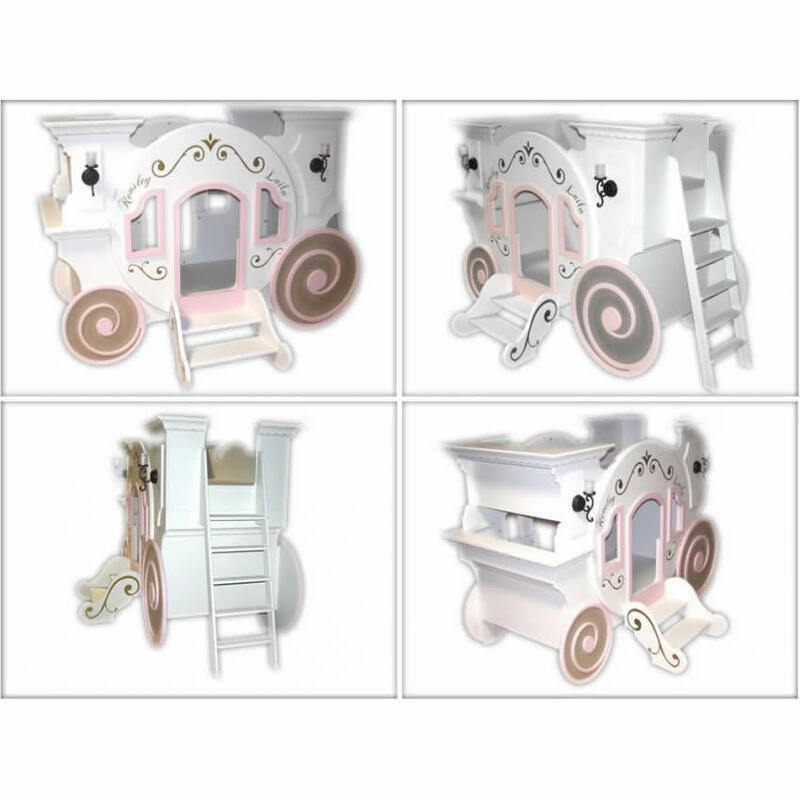 Let us know your ideas, and we'll work with you to create the kids princess furniture of your dreams! 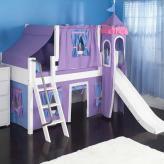 Maybe your princess wants to have her sleeping quarters on the top level to leave the lower level open for fun. Would she like us to install benches in the lower level for a genuine carriage look? This is just one possibility, and we welcome your ideas.